I was sick all weekend with a sinus thing and didn’t go to work yesterday. I suppose that was fortuitous because it allowed me to help poor guinea pig Cappy, who I found in distress in the morning. She’s been ill for months but had done well lately after we figured out she had an ear infection and we got her on some antibiotics. In fact, last week I thought she had rallied so well I expected to have her around for a long time! Little Cappy came to me in 2003 as a temporary boarder while her Zionsville classroom was on break. She had a tilted head and then an abscess burst from between her ears, and the school didn’t want to pay any of the vet bills, saying I could “just keep her” if she was going to be accumulating vet expenses. What, only dogs and cats deserve medical care?? Of course this event only cemented my opinion that animals don’t belong as classroom pets. 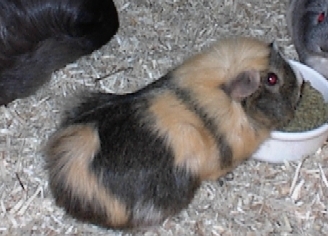 Anyway, I did keep her, and she lived a long (if head-tilted) life with her piggy buddies, both of whom she outlived. She not only battled through the head abscess but also reproductive cancer. During the recent ear infection episode, we found a pus-like ball the size of a chickpea filling one ear and a return of pus to the location of the old abscess, a deep wound in the brain area. Our best guess is that she originally experienced a puncture wound, like from a cat bite or something stabbing her (let’s just say I’ve heard of more than one classroom pet being poked with pencils). Cappy was probably about seven and I’m glad I kept her and gave her the life she deserved. In a strange twist of fate, I had already arranged to adopt another piggy before she passed, hopefully to keep her company. I suppose I’m now in a position to adopt more than one and help out the 200+ guinea pigs in rescue within a couple of hours of Indianapolis. Oh, poor Cappy. I’m so sorry! She certainly did have a great life with you, though. Sorry to hear about Cappy, that’s too bad. She was obviously loved, outliving her companions despite her compromised health.